After nearly two years of questing through the audio underworld, wrestling crocodile-headed samplers and taming fire-breathing speaker stacks, Spoonbill has returned to the earth's surface, ready to address his ecstatic followers. 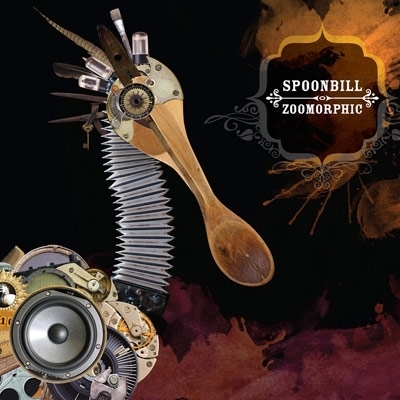 His message: Zoomorphic, a shapeshifting sonic celebration of Spoonbillism. Zoomorphic is set to earn Australia's most unique aural oracle thousands of fresh converts across the globe. following the critically acclaimed Megafauna (2005) and Nestegg (2007). This time around, Spoonbill's anarchic, quirk-funk, glitched-up aesthetic has been forensically finessed like never before, sculpted to a well-bodied medley of groove-based sound art. The Zoomorphic experience is crafted from an intricate web of edited studio recordings of exceptional musos melded with found sounds, foley folly and synthesised materials, much of which was captured while recently touring across US, Canada, Europe & UK. Squishy pulsating bass lines carpet the undergrowth, while dirty squelchy synth licks frolic in a warped menagerie of neurotic cyborgs, rattlesnakes, sirens, champagne froth, fireworks and crushed eggshells. The jamboree coalesces to form a single groove shrieking beat-creature, covered with feathers, scales, bells and whistles. Zoomorphic is a diverse musical mutant for late-night dancefloors, introspective train-rides, and everything in between. This fresh batch of Spoonytunes will captivate fans of glitch-hop, IDM, breaks, psychedelic electronica, folktronica, dubstep, trip-hop and more – but the Spoonbill's mighty call can't be pigeon-holed into any single genre. Some folk call it “vaudeville electronica”, responding to the jovial carnival feel like circus clowns with lobsters in their pants.